As a solar canopy company, Structural Solar designs to stringent specifications assuring durability and long term customer satisfaction. 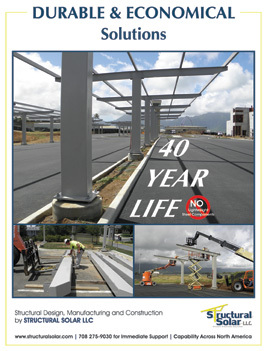 Depending on owner preference, the Structural Solar offers solar canopies with either industrial -marine grade paint or hot dipped galvanized coatings. Structural Solar utilizes ultra-efficient sales and design process and can take the project from concept to completion quickly and seamlessly. Accordingly, the company has become the premier solar canopy supplier for solar installations on the East Coast, Midwest and mid-Atlantic regions.